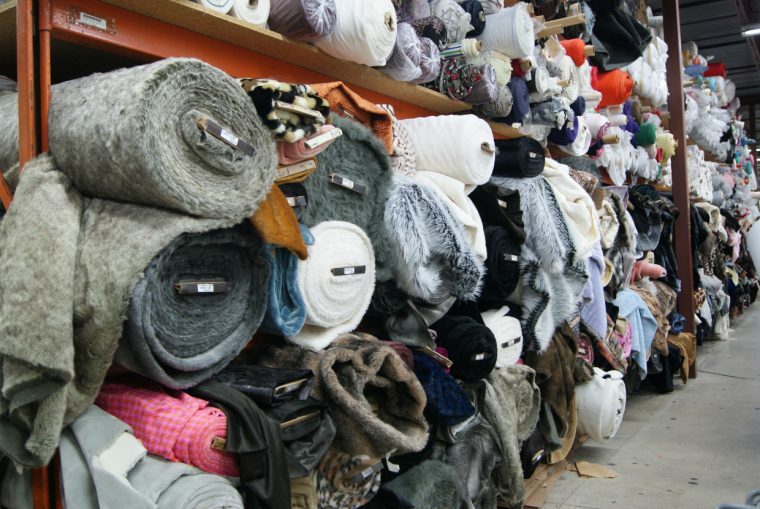 Today we have the second installment in what we plan to make into a large series of posts about fabric shopping around the world. Liesl kicked off the series with her Fabric Shopping in Madrid post, and today I’m bringing you a fabric shopping guide for my hometown, Minneapolis, MN. When you try to shop for fabric in a country that isn’t your own, you’ll find that sewing terms aren’t easily translated. To help you out, we created the Sewing Translator, which many of you have contributed to and use. We hope it will be useful to you as well in your travels. Sewing Translator is now available in 14 different languages, and if you have an iPhone or iPad you can download it to use the native iOS app off-line as well. We hope you’ll make good use of it! You can find Sewing Translator in the Apple app store, and it’s free. SR Harris is like fabric heaven. I’ve heard it’s on a par with what can be found in New York City. There are two locations, one of which is a 30,000 square foot warehouse. 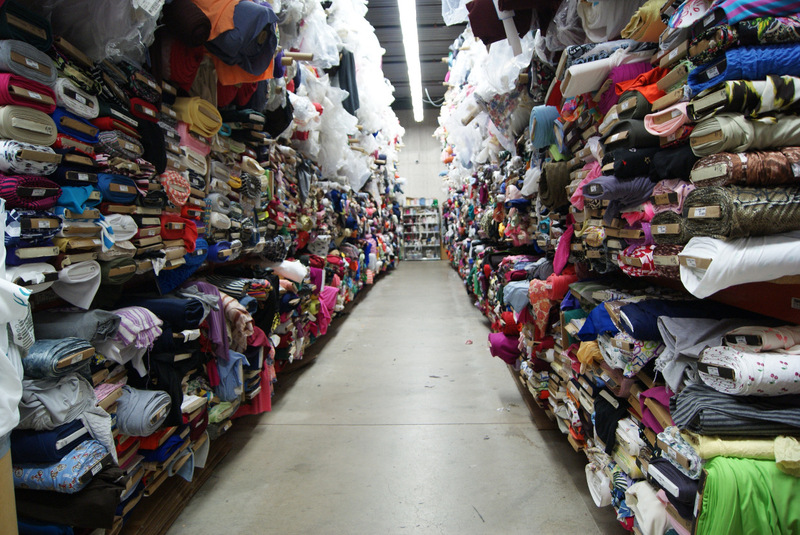 This place has aisles and aisles of fabrics. You take your fabrics to their large cutting tables, measure and cut your fabrics yourself. Then put an orange sticker on it with the amount and price. And you have to return your fabrics back to where they belong, so you cannot forget where you found them. Here is just a small section of the quilting cottons. 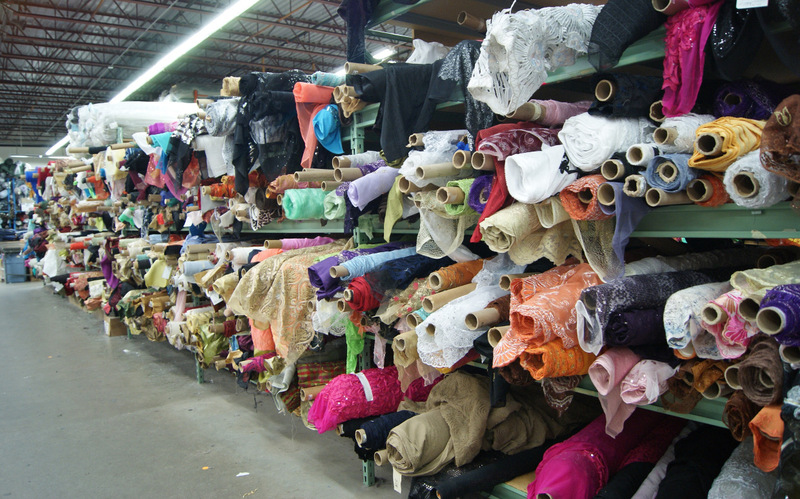 There are fashion fabrics galore. Here are some silks and sequined fabrics. 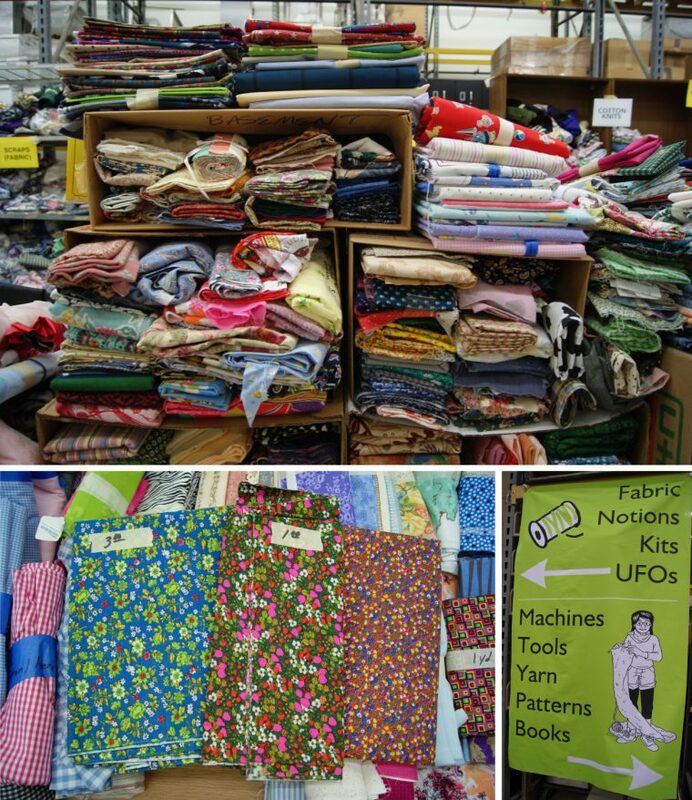 You’ll find lots of knit fabrics, everything you’d need for t-shirts and leggings. Have fun with some faux furs. And here are even more fashion fabrics. You’ll also find buttons by the pound and many other notions as well as a wide variety of trims. 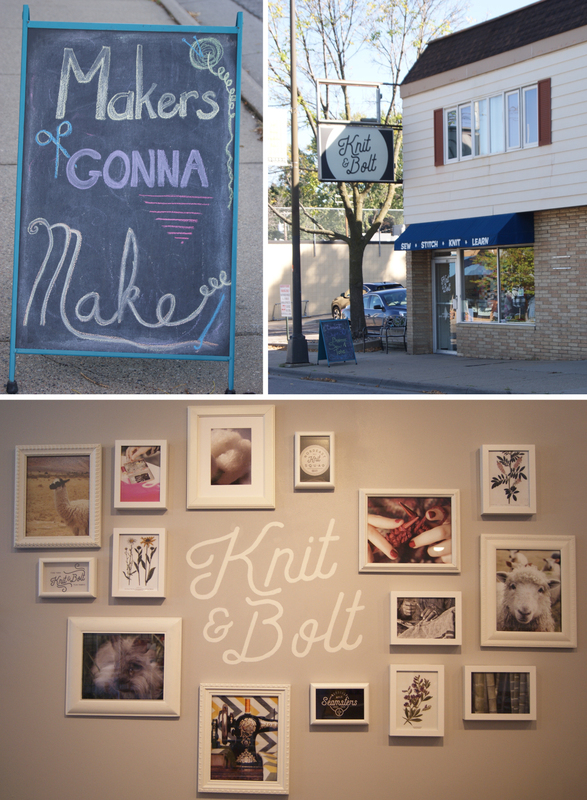 Knit and Bolt is a charming neighborhood modern quilt shop that opened in April 2017. 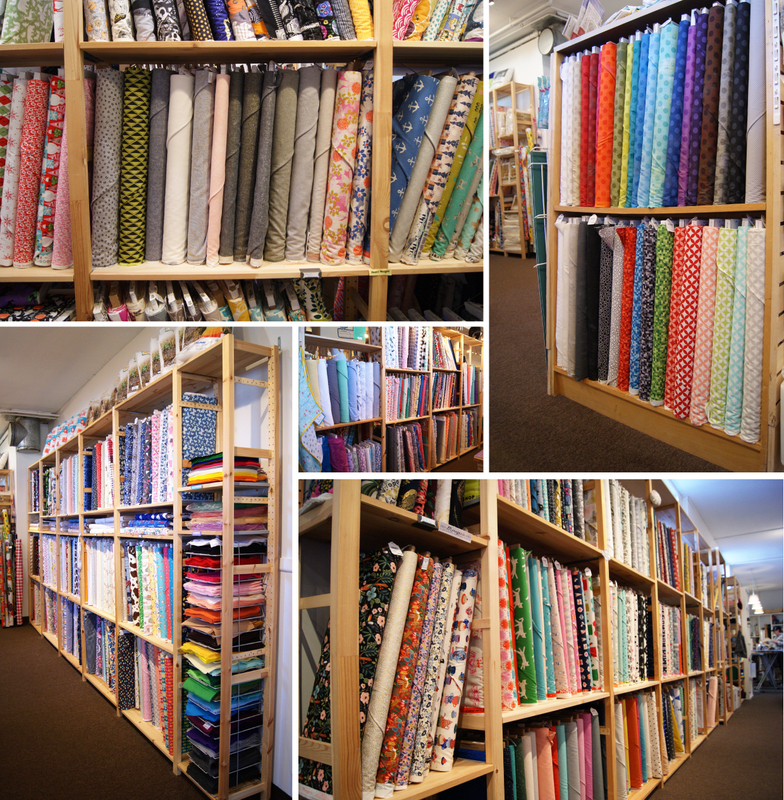 They carry fabric lines like Robert Kaufman and Cotton+Steel. The space is very clean and you’ll find that there’s plenty of room while you’re shopping. They also carry hard–to-find items like cork fabric, Zirkel magnetic pin holders, and everything that you would need for Sashiko embroidery. They offer several classes and you can even take a class on how to sew the Liesl + Co. Maritime Knit Top. 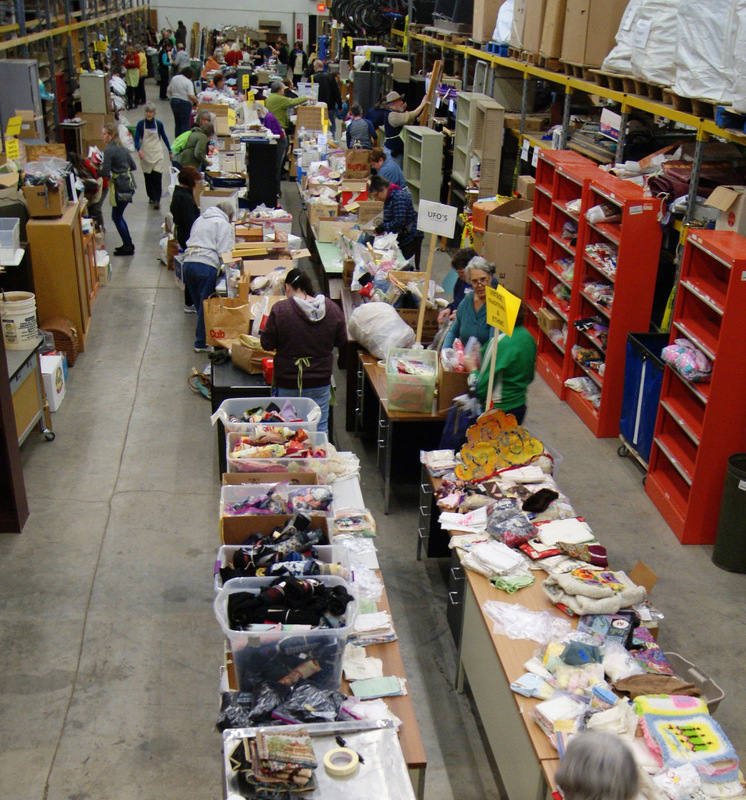 Held in mid-April in a large warehouse, World’s Largest Textile Garage Sale earned $63,000 in 2017. 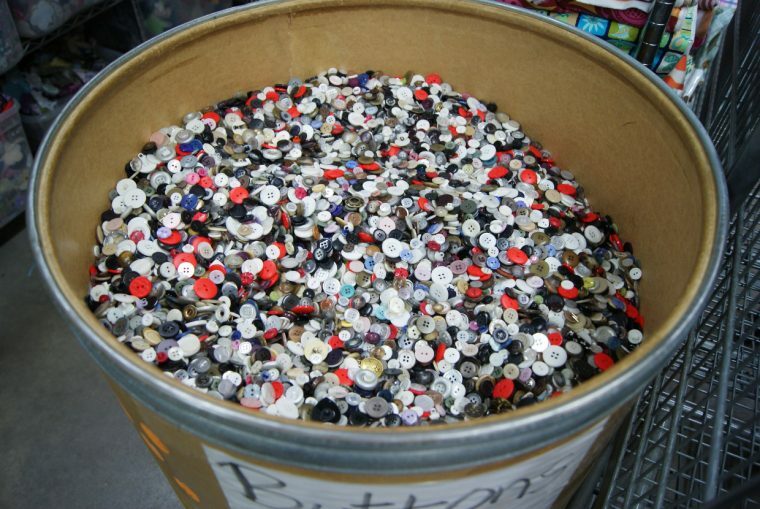 That just goes to show you how much fabric and sewing related items they sell, keeping tons upon tons of materials out of landfills. I won’t say much about it as I’ve already blogged about it here. Take a look at that post to find out more about this event. Also there is a Garage Sale Pop Up, which is a much smaller version that takes place in October. We’re going to continue this series, visiting cities all over the world. Would you like to contribute a post for your city? We would love to hear from you! Leave a comment telling us what city you could cover, and we will be in touch. This is a great idea! I love going fabric shopping when I travel. It’s like a treat for me… I take back home some presents for the kids and some fabric for me! I will definitively have to go to Minneapolis…. There are so many reasons to come to Minneapolis and S.R. Harris is just one of them! I haven’t been to the one up on the northern side, but the one in Burnsville is an easy drive from MOA, south on 77 over the Minnesota River and onto Highway 13 for a few miles. Traffic is never too heavy unless it’s rush hour.. The Garage Pop Up Sale is given by the Textile Center near the university; which I have yet to visit (and want to) but it’s on the light rail route. And beyond the mall, we have a vibrant theater, music and museum culture, as well as history and bookstores galore! Oh, and I hear there’s some lakes. : ). I’m sure there is a whole bunch of good reasons for visiting Minneapolis. I’d wish not to have an ocean and a few lakes between your beautiful city and mine…. You did leave one of my favorite stores off of your list- it is technically in St. Paul, but I think it’s close enough. 🙂 Treadle Yard Goods on Grand Ave has a lot of great fashion fabrics. And the staff has always been so helpful when I’m trying to sew with a fabric that I haven’t seen before. Perhaps it is a new type of fabric that she hasn’t seen before. And Grand Avenue is a great place to shop and eat! St. Paul is a lovely old city on the Mississippi and worth a visit, too. Very odd because Treadle Yard Goods in St. Paul is much closer to Minneapolis than either SR Harris location is. glad to know they’re still there. I shopped there 40 years ago when I lived there. Still miss the Twin Cities! I totally second the recommendation of Treadle Yard Goods. 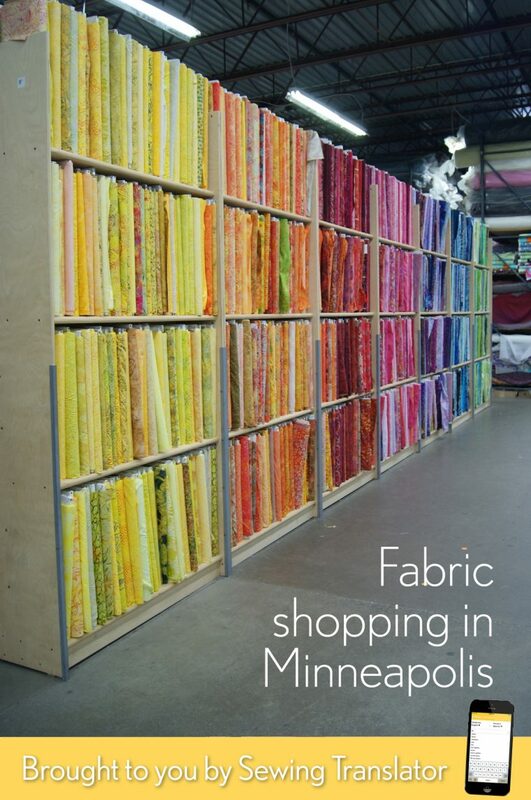 I live in NYC but do all my best fabric shopping in St. Paul. It’s so beautifully curated and when you’re working out an idea everyone gets in on the action. Love. This is awesome! I’m so excited to go check out SR Harris and the garage sale! I would add Treadle Yard Goods to this list. 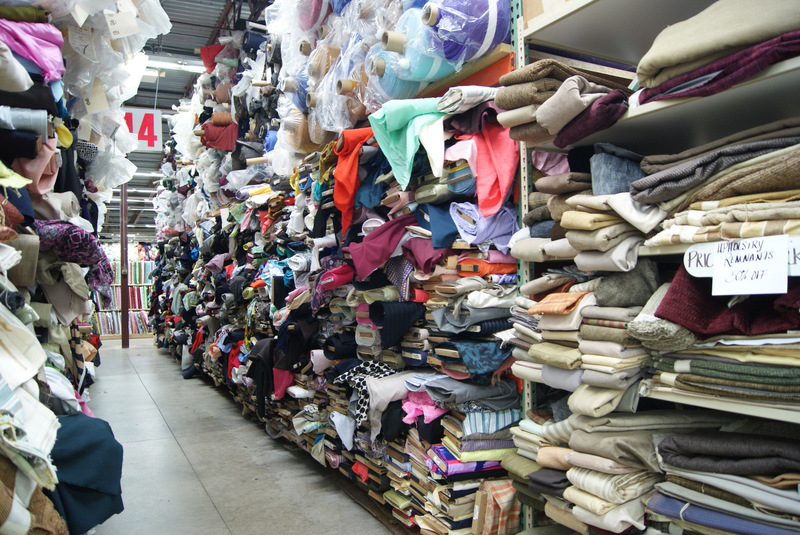 They have classes, super knowledgeable staff and a great selection of fabrics. Good list! I’d like to add Bear Patch Quilting Co in White Bear Lake to the list. Great fabric, thread, batting, and pattern selection, and it’s located in the cute downtown area that’s filled with other great, small businesses (including a yarn shop a few blocks away)! I live a couple of miles from the Burnsville SR Harris, but a drive up to WBL is always worth it! It is a very cute shopping area and if one is visiting the area, the lake is big, beautiful and historical, where resorts and hotels provided summer retreats from city heat for the wealthy. They’re all gone now, although the White Bear Lake Yacht Club, which eventually requested F. Scott and his Zelda to leave, is still across the lake. I could make one about Brussels if anyone would find it interesting. I would as we travel to France to see family and pop over to Brussels on occasion. It would be fun to check out what is there. I visit family near Waterloo. I would love such a list. Thank you! 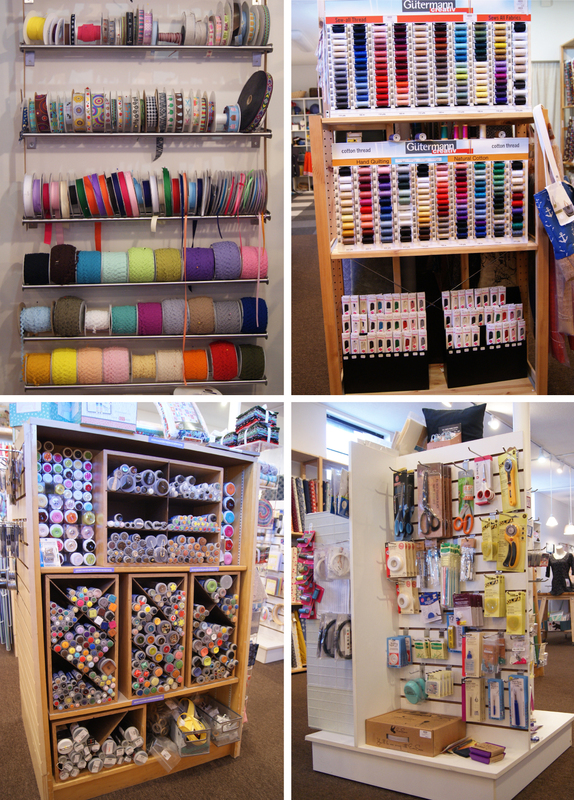 Asheville, NC – lots of sewing/textile work (though indie fabric stores are slightly more scarce). We will be in Asheville soon. Do you have any suggestions for fabric or even yarn? I’d like to contribute to the fabric store list in the Twin Cities. There are two other amazing places to get absolutely fabulous fabric and other findings for your sewing needs: The Sewing Lounge and The Treadle Yard Goods. Both are in St. Paul and very easy to get to. Wow, I’d never heard of The Sewing Lounge! Thanks! My vision is poor, so I don’t shop in stores much, but I’m definitely going to make these excursions. Knit & Bolt is 10 minutes from my house – my philosophy is if Knit & Bolt doesn’t carry it, I don’t need it (I’m totally overwhelmed by SR Harris). Thanks for highlighting my favorite shop! The first time I hit SR Harris my kindergartener fell asleep in the cart amidst the bolts. I met several people from out of state who make it a regular stop on their visits for the range of fabrics and the prices. Textile Garage Sale is amazing. This is so wonderful, I work in Minneapolis and live in Maple Grove. I’ve been here a year and had no idea about any of these places. Thank you thank you thank you ! Ang – the fabric pop-up garage sale starts in about 40 minutes. If you have the time, it might be worth the trip today. Good hunting! Thank you for this list. I would add Treadle Yard Goods, in St Paul, they have beautiful fabrics and the staff there is wonderful. I actually go to the mainland (Vancouver, BC Canada) to buy fabric once a year, and visit family at the same time. I shop at Fabricana over there in Richmond, outside Vancouver. We have a Fabricland locally (Fabricville on line) in Victoria BC Canada but sometimes you get tired looking at the same stuff over and over again. Different store have different stock. When you have all that beauty surrounding you, who needs fabric? LOL! Don’t forget about Twin Cities Quilting in St. Paul , too. Gorgeous cottons not just for quilting. I live walking distance to Treacle Yard Goods and the Sewing Lounge..,.,dangerous!! I travel to Florida for winter. Will you do a great place there? I’m in the UK, I’m so envious!! I live in New Delhi, and would love to cover some places here (and thereby also get a chance to visit shops I haven’t been to before :-). The textile garage sale sounds enviable. Wish I lived closer. Did anyone in the Twin Cities area have a chance to get to the garage sale this weekend? If so, I’d love to hear about it! I love a fabric shopping trip to the cities! If you’re heading west into the cities, Stitch Supply Co is just off of 94 in Eau Claire/Altoona, Wisconsin. Lots of modern fabric and a beautiful retreat center! It’s a great place to stop in between the cities and Milwaukee or Chicago! Awesome! Family members head east toward Madison on a regular basis. Thanks for the tip!